Where "better" means that I turned an apple into a 500 calorie snack, woot! But seriously, this is to get my essential omega 3 fats in. Do you know, I used to buy Land O'Lakes Omega 3 eggs and they came up on the grocery store receipt as LOL OMG EGGS. I have to tell you, I was photographing this and the bowl of peanut butter dip flipped over headed for the floor. And I caught it square in the middle... of the peanut butter... with my foot... and flipped it back over without spilling a drop of dip. Though I did get some on my sock. AND THEN I ATE IT. What, it was way less than three seconds. Grind the flaxseed in a coffee grinder. Mix ground flaxseed, flaxseed oil, and peanut butter in a small bowl. 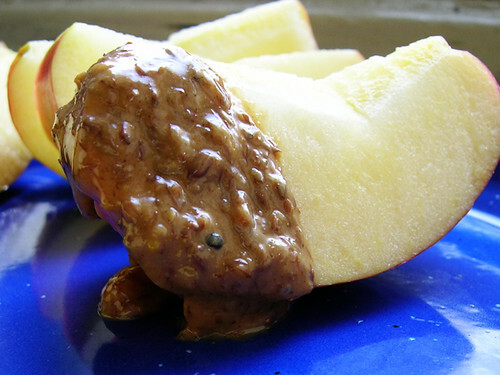 Cut up the apple and eat with the peanut butter.